VitaClay is a faster, easier, truly a mess-free and notably more delicious and nutritious way to make a large batch of bone broth, chili, stew, steamed vegetables or fish, jook and soup. Our low temperature setting adds an extra bonus�probiotic-rich creamy yogurt. With doctors recommending bone broth, gluten free grains, less salt, less sugar and fresh ingredients, this 6.5 quart crock pot and stock pot is the number one choice as it amplifies flavors, and alkalizes foods, increasing the positive interactions between the nutrients. 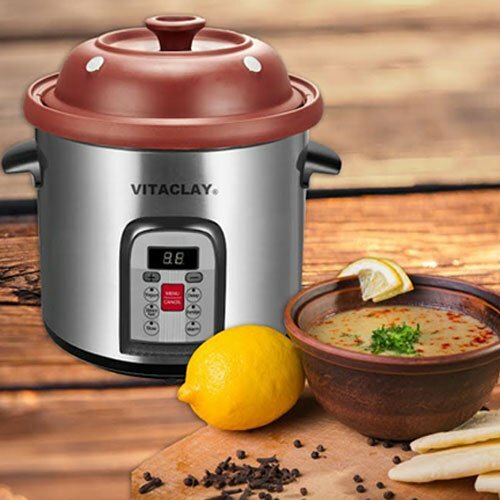 Cook all your foods to perfection with the fully programmable, top-rated, smart and fast VitaClay Multi Crock n' Stock Pots. Your broths, stocks and soup bases are finally made easy and fast using VitaClay technology� � from simple chicken broth to rich, clear consomme, or calcium-rich clamshell or shrimp stock. Our free recipe book offers a variety of globally inspired stock-based recipes for your savory breakfast, satisfying lunches or a deeply nourishing dinner options. To add more nutrition in your diet and time to your busy life-choose the VitaClay Multi Crock N' Stock Pots! High fired at 2400 degree and it�s LEAD free! Cooks 4 times faster than your mother�s slow cooker! Your whole meals can be ready as little as 30 minutes or in less than an hour! I am not in the habit of writing reviews, but I thought that I would take the time to write one up this time. I love my new VitaClay. My old crock pot broke a couple of years ago, and I wasn't sure what I wanted to buy. I did not want one that was made in China or ceramic due to health concerns. I was thrilled to learn that there was another alternative. I have only had it for a week, and I have used it almost every day. It is simple to use, and it doesn't take up a lot of room on my counter. I have made chicken stock, chicken soup, lentil soup and oatmeal. It is also very easy to clean for its next use. I look forward to making more hearty soups for the coming winter.